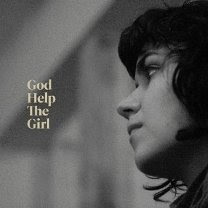 Stuart Murdoch has finally delivered a masterpiece with the multi-vocalist project, God Help The Girl, out in the U.S. on June 23 via Matador Records. I say that because, as was always obvious, Belle and Sebastian had the potential to become a bit too precious for their own good; 2004's Dear Catastrophe Waitress went some way to removing that possibility. However, the indie scene is also a bit too precious for its own good and people seem to forget that, for all their supposed feyness, The Smiths were really a mainstream band with simply too-smart-for-the-mainstream lyrics. And other indie bands, like Oasis and Pulp, never shied from the mainstream even if they were the products of various indie scenes or labels. The point being that you can clutch your cardigan sweater, work on your Louise Brooks haircut, and collect Felt singles your whole life, but eventually you have to set your sights higher than that. And with this project, Murdoch has done precisely that. While there are some slight similarities to early Everything But The Girl, the biggest compliment I can pay the disc is that it sounds like a lost CD from the Dream Babes compilation series curated by former Saint Etienne frontman Bob Stanley. The other important point I want to make about music like this is how effortlessly "retro" it is without being ironic. The great thing about The Pipettes was how, on the surface, it was all dangerously kitsch dance routines and polkadotted dresses, but underneath that presentation, the tunes were fantastically constructed little slices of great British pop. Like The Primitives before them, The Pipettes managed to take elements from the past and actually make something new with them, instead of simply putting on a revival show, like Ronettes-mania for hipsters. I don't really care about the details -- Pitchfork has the facts about the collaborators -- and I'm not so sure that I believe that this thing really is the soundtrack to some future motion picture from Murdoch. All that stuff is irrelevant when dealing with what is simply a great pop album. The Northern Soul spin on the earlier Belle and Sebastian song "Funny Little Frog" launches what was previously a well-produced bit of B&S whimsy into a full-bodied, adult song full of the kind of soul that Alison Moyet only ever hinted at; the past filtered through a modern, unironic sensibility. The title song echoes Cilla Black, and the Neil Hannon-led "Perfection as a Hipster" is -- as per his usual best work -- Scott Walker smoothed of the difficult bits. Murdoch's voice on a few cuts is the only other reminder that this is a B&S-affiliated project. And the string-led "Musician, Please Take Heed" is what the Morrissey-and-Marr collaborations with Sandie Shaw *should* have sounded like. And I've only played the album twice so far! Rough Trade Records in the UK posted a film clip on YouTube so here it is! New Puffy Album, Bring It!